During recovery there maybe the option to install 32 bit or 64 bit Windows 7. It is advisable to choose 64 bit, as this will take full advantage of your computers hardware. However if you have any concerns for software compatibility (such as older games etc) please choose 32 bit. To start the recovery from the CD/DVD put it into the drive and restart the computer. 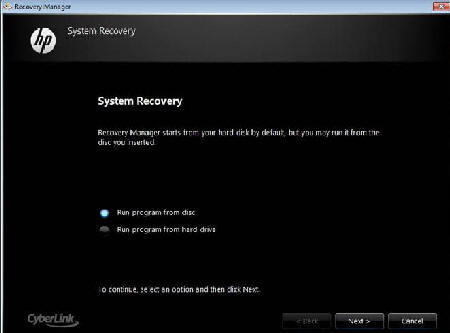 If the hard drive recovery partition is still intact you will be prompted to run the recovery from the hard drive or the disk. Choose the appropriate option. When Recovery Manager has loaded you will be presented with one of the two screen below depending on if the recovery media was created or supplied directly by the manufacturer. *Backup may not be possible when booting directly into recovery manager with a corrupted user partition.